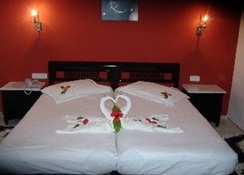 This charming, family-friendly hotel is air-conditioned and comprises a total of 195 rooms. Guests are welcomed in the lobby, which offers a 24-hour reception and a 24-hour check-out service, as well as a hotel safe, currency exchange facilities, a cloakroom and lift access to the upper floors. 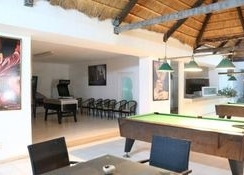 Facilities on offer to guests include a hairdressing salon, a games room and a TV lounge. Younger guests will enjoy the children's playground. Children will also be entertained at the kids' club. Guests can enjoy a drink at the bar and dine in the restaurant. Conference facilities are available to business travellers in the form of a meeting room. Guests can take advantage of the room service (for an additional fee). Those arriving by car may leave their vehicles in the hotel car park. 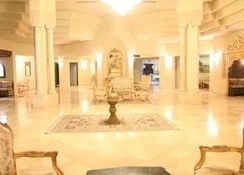 LocationThe hotel is located just 5 km from the centre of Hammamet. The bus station can be found around 3 km away. The beach can be reached within a 15-minute walk. Carthage is approximately 80 km from the hotel. Tunis-Carthage International Airport is reachable in less than an hour by car. RoomsAll rooms come with an en suite bathroom with a shower/bath. Guests can enjoy a good night's rest on their double or king-size bed. Rooms also come equipped with a minibar. Standard in-room amenities include satellite TV. Furthermore, air conditioning and individually regulated heating are provided in all accommodation as standard. Each room features a balcony or terrace. SportThe hotel features a heated indoor and outdoor swimming pool with a children's swimming area. Guests can relax beneath the parasols. Fitness enthusiasts may enjoy participating in an aqua fit or aerobics session (for a fee) or working out in the gym. For fees, guests can relax in the hot tub and sauna. Guests can also pamper themselves with a spa or massage treatment (each for a fee). Guests can try their hand at a range of water sports, including jet skiing, windsurfing and pedal boating (each for a fee). It is also possible to enjoy a game of table tennis, pool/snooker, volleyball or beach volleyball on the premises (each for a fee). Archery is also offered and, for a fee, guests can go horse riding. Fans of the fairway can head to the nearest golf course, the Yasmine Golf Course, which is less than a 10-minute drive away from the hotel. There is an entertainment programme on offer for adults and children. Moreover, sun loungers and parasols are available for hire on the nearby sandy beach. MealsA continental buffet breakfast is served each morning at the hotel. Lunch and dinner can each be enjoyed from a buffet. PaymentAmerican Express, MasterCard and VISA are accepted at this hotel.